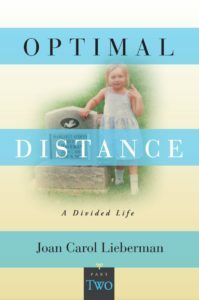 OPTIMAL DISTANCE– A Divided Life, Part One and Part Two is an extraordinary excavation of Joan Carol Lieberman’s personal history from birth to her seventy-fifth birthday. Her diary entries describing her search for optimal distance from others, from death, and the apprehension of God take readers on a journey filled with dreams and disasters, synchronicity and science, and history transformed into hope. Insightful and heartbreaking, the intimacy of her luminous writing will stay with you forever. 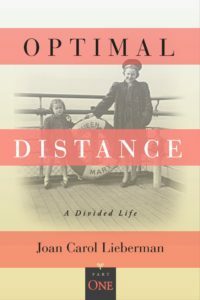 The publication of OPTIMAL DISTANCE was the only item on her husband’s bucket list. Reading it should be on yours.